Toyota's Exclusive System of Active Stability available on selected Forklifts! Toyota's System of Active Stability (SAS) is the first system in the world to monitor and control the forklift through a combination of advanced sensors linked to an on-board controller, enabling superb load-handling performance with outstanding safety. Since its introduction in 1998, over 500,000 SAS equipped forklifts have been sold around the world. SAS is similar in concept to Anti-Lock Brake Systems (ABS) and Vehicle Stability Control Systems, in that it significantly contributes to accident prevention by enhancing control in the stability range of the forklift before it enters into a range of unstable operation. Toyota has accomplished this function through the synergistic total of seven WORLD FIRST innovations. SAS sensors detect motion during operation and the computer analyses the potential for a tipover. If the computer determines that the potential for a tipover exists, it sends a signal to the appropriate actuators which then operate to minimise the potential for a tipover. All of these innovations are based on the fact that the stability of a forklift changes constantly due to shifts in the balance of the load coupled with the speed and turning rate of the forklift. Forklift Safety - Why is it so important? Every year, an alarming number of forklift operators are involved in workplace accidents. According to the WORKSAFE VICTORIA (Forklift Safety - Reducing the Risk), between January 1985 and January 2003 there were 48 deaths in Victoria associated with forklifts. Statistics show that collisions with pedestrians and loads falling onto pedestrians were the main contributor and accounted for 56% of the fatalities. It is recommended that forklifts are segregated from pedestrians by having exclusion zones where forklifts cannot enter areas where there are pedestrians. Then came lateral tip-over as the next main contributor, accounting for 29% of the fatalities within the workplace (refer graph below). These tip-overs occur when a forklift takes a corner too sharp or too fast, increasing the lateral gravitational force of the forklift into a dangerous zone. If the forklift's centre of gravity shifts outside its three support points, or stability triangle (see below), wheels can lift and the unit can tip over. This can result in serious operator injury, including permanent disability, or even death. Operators must always wear the seatbelt on counterbalanced forklifts. In the case of counter-balanced forklifts it is a misconception that the forklift is supported by 4 points i.e. the 4 wheels. In actual fact the steer axle is able to pivot in the centre and therefore, the forklift is supported only at this point on the rear and the two drive wheels at the front. The rear axle is free to pivot around its centre pin. It is obvious that safety has been a prominent theme throughout the evolution of the forklift. With Toyota, the importance of safety can be seen in the providing of an overhead guard as standard in the '70's, the introduction of the Wide Visible Mast in the '80's, and the introduction of the Operator Restraint Seat (ORS) from the start of 1998. In November 1998, Toyota again revolutionised the concept of forklift safety and productivity with the release of its 7-Series range of forklifts, and their world's first feature of "System of Active Stability" (SAS). Toyota is a technology leader in forklift safety, with its leading edge system of Active Stability control (SAS) as standard equipment on selected* 7-Series and 8-Series internal combustion and battery electric models on 4 wheel counterbalanced forklifts. *SAS is an optional extra on the 8FB Series battery-electric forklifts. # Active Control Rear Stabiliser isn't available on the 7-Series 3 wheel battery-electric forklifts. Toyota forklifts equipped with the Toyota System of Active Stability™ (SAS) use intelligent technologies to reduce your driver costs and damage costs. This may result in a significant reduction in overall forklift operating costs. Workflow is faster and safer, therefore improving productivity. Only Toyota forklifts with SAS know how to move loads safely and drive down costs. Toyota's SAS was the first system in the world to monitor and control the forklift through a combination of advanced sensors linked to an on-board controller, enabling superb load-handling performance with outstanding safety. 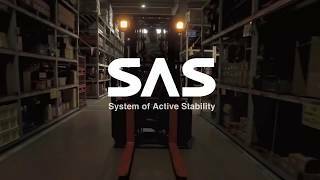 SAS significantly contributes to accident prevention by enhancing control in the stability range of the forklift before it enters into a range of unstable operation. SAS addresses costs in two key areas: driver costs and damage costs. These areas can collectively account for more than 70% of your forklift's total operating costs. SAS can deliver immediate savings, protecting your drivers and your bottom line. These innovative features, however, in no way override the value of sensible employees, professional training and strict adherence to safety regulations and to the forklift manufacturer's instructions. But, they certainly provide you with more ways to create a safer work environment.